Lakshmi, also known as Mahalakshmi, is the Hindu Goddess of prosperity (both material and spiritual), wealth, and fortune, as well as the embodiment of beauty. She is the consort of the Lord Vishnu. Devotees believe that Lakshmi brings good luck, and protects them from misery and money-related sorrows. As well as being worshipped by Hindus, depictions of Lakshmi are found on Jain monuments. The festivals of Diwali and Kojagiri Purnima are held in Lakshmi's honor. Lakshmi has many names, and is especially associated with the lotus (padma). Lakshmi is depicted as having a golden complexion and long dark wavy hair. She wears red or gold clothing, gold jewelry, and a gold crown encrusted with rubies. A red costume represents continuous activity, whereas a golden costume represents fulfillment. 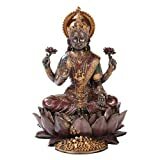 This Goddess Lakshmi Seated On Lotus is intricately sculpted with cast resin bonded with crushed stone. Dimensions: H: 9.5" x W: 5.25"
Measures: L: 5" x W: 4" x H: 7"
This Goddess Lakshmi Statue measures HEIGHT 6.25" LENGTH 5" WIDTH 3.5" approximately. 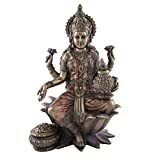 This beautiful sculpture of the goddess lakshmi portrays her justly, as the granter of wealth and fortune. She sits on her lotus throne and in her hands are comfort, promotion, gold and fortune flower. Lakshmi (Sanskrit: लक्ष्मी lakṣmī, Hindi pronunciation: [ˈləkʃmi]) is the Hindu goddess of wealth, prosperity (both material and spiritual), fortune, and the embodiment of beauty. She is the consort of the god Vishnu. Also called Mahalakshmi, she is said to bring good luck and is believed to protect her devotees from all kinds of misery and money-related sorrows. Representations of Lakshmi are also found in Jain monuments. Lakshmi is called Shri or Thirumagal because she is endowed with six auspicious and divine qualities, or Gunas, and also because she is the source of strength even to Vishnu. When Vishnu incarnated on earth as avatars Rama and Krishna, Lakshmi incarnated as his consort. Sita (Rama's wife), Radha (Krishna's lover) and Rukmini and the other wives of Krishna are considered forms of Lakshmi. 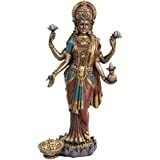 Lakshmi is worshipped daily in Hindu homes and commercial establishments as the goddess of wealth. She also enjoys worship as the consort of Vishnu in many temples. The festivals of Diwali and Kojagiri Purnima are celebrated in her honour.